The move by the TSB has been condemned as “short sighted” by a local councillor. The bank has announced a number of changes to opening hours across its network of Fife branches. While no jobs will be lost, it means the level of service will be diminished – Anstruther, Buckhaven and Cupar have already been hit. Now the bank has announced reduced opening hours in Burntisland. It says a three per cent drop in customer usage is the reason to cut opening to just two days per week – to Tuesdays and Fridays. The TSB says 82 per cent of customers either use another branch, or digital or telephone banking. The changes take effect from the end of July. A statement from TSB said: “Rather than close the branch, we are reducing opening hours which will mean that from the end of July the Burntisland branch will now be open on Tuesday and Friday between 09.30-1230 and 1.30-4.30. When the Burntisland branch closes, the nearest branch will be in Kirkcaldy – 5.6 miles away. The decision to cut opening hours in the town was criticised by Councillor Lesley Backhouse – and she asked for them to be delayed. The SNP member challenged the bank’s footfall figures, arguing the busy summer months, when tourists visit and the market moves on to The Links, would show a higher than average usage. 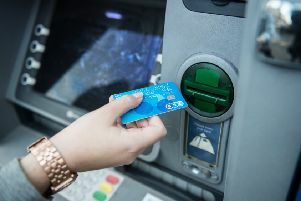 She said: “Burntisland, Kinghorn and Aberdour do not have any other banks, and I would think if you review the summer usage of the cash machine you will see the extent of the summer trade in Burntisland. “The population increases by over 50 per cent with the numerous hotels and guest houses in the town and the two caravan and camp sites which are located between Burntisland and Kinghorn. “It is short sighted to reduce this service just as summer is approaching. “I would ask that you reconsider the reduction in hours until after our busy summer months. Numerous small business and organisations in the town use your service and this reduction in hours will adversely affect the cash flowing round the local economy.